The Bowflex Revolution home gym is the smoothest, most versatile equipment we have ever designed. Not available in any store. The Bowflex home gym offers you all the strength training equipment you'll find at your local gym all in one machine. 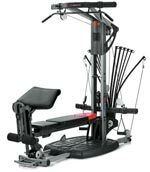 SpiraFlex Resistance Technology is Bowflex's patented resistance technology that duplicates the benefits of free weights. With it, you'll feel the difference compared to other home gyms. The Bowflex revolution home gym comes with 220 lbs of resistance, and is upgradeable to 300 lbs for upper body workouts, and upgradeable to 600lbs for lower body workouts. Upper Body Workouts - the Bow Flex Revolution home gym can duplicate almost any exercise from your local gym. 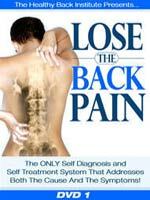 Including exercises such as the bench press, curls, leg press, leg curls, and much more. It comes with The Freedom Arms, which can adjust 170° to work muscles from various angles. 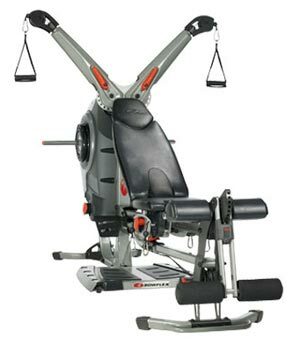 The Bowflex home gym also features a Preacher Curl attachment to isolate your biceps and work your upper arms. Lower Body Workouts - the Bowflex Revolution home gym can accommodate up to 600lbs for the leg press station (with upgrade). It offers a range and power unheard of in a home gym. 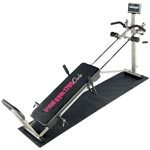 Core and Abs Workout - the Bowflex also features a wide variety of abdominal exercises you can perform plus a wide variety of cardio workouts such as the built-in rowing machine. Your satisfaction is guaranteed. 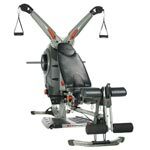 Just purchase your Bowflex Revolution Home Gym and workout for up to six weeks. If you're not 100% satisfied with the results, simply contact Bowflex customer service department for Return Authorization. The Bowflex Revolution Home Gym will deliver years of worry-free performance. It's backed by a strong 10 year limited warranty covering defects in material or workmanship.